Remembrance /ri mem' brens/, v.t. something that serves to keep in mind some special place, person or event. Memento. 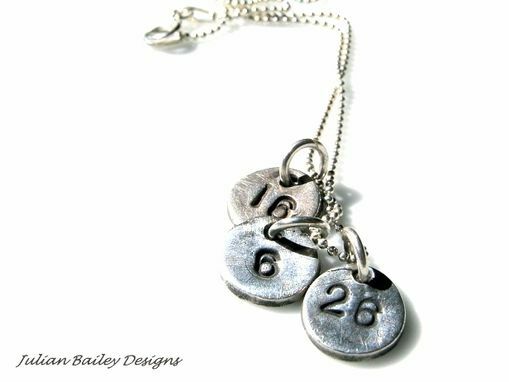 This necklace has three handmade pmc fine silver charms stamped with some pretty important numbers to me; the three dates my children were born. The charms are suspended from a sterling silver ball chain necklace. This listing is for three numbered charms on the same chain. They are made to order. Please note: I am very flexible, so more or less charms are available to you. Each extra charm is $5. 18" chain is also available. Pricing for 18" sterling silver chain is based on current market value.